A visit to the Jan Jaati Sanghralaya (Tribal Museum) of Bhopal (Madhya Pradesh, India) brought back the memories of my childhood. If anyone had asked me what kind of games do the tribal children in India play, I wouldn’t have known what to answer. I was surprised that most of the tribal games shown in this museum are the same games that I had played while growing up in the Delhi of 1950s and 1960s. This post presents images of the traditional games played by children in India before the TV and video-games culture took over our lives. The images of this post come from the Tribal Museum of Bhopal as well as from other parts of India. Let me start this post with an image that I love. It is of a simple innocent game - a girl playing with a balloon. I love it because, in it the girl has been dressed in a sari like an adult, but she is still a child and she expresses the innocent joy of her childhood in her play. References to games where players use a dice are found in the ancient Hindu texts of Rigveda and Mahabharat. The war of Kurukshetra, the central event of Mahabharat, starts from a game of Chausar, a dice-based board game, in which the elder Pandav brothers, Yudhisthir, bets on his wife Draupadi. 17th precept of Buddha in Brahmajala Sutta written in ancient Pali language advices the followers to avoid playing games and thus provides a list of common games played in India the BCE era. The image below shows the English translation of this text along with the descriptions of different games. A bass relief sculpture from the Buddhist stupa ruins from 2nd century BCE in Bhahut village of Satna district in Madhya Pradesh shows persons playing a chausar or chaupad like game with the dice. Thus, ancient Indians had different kinds of popular games. You will find echoes of many of those games in those described below, with which I had grown up. Most of these games do not require any special equipment. Sometimes they include a ball made from scraps of old clothes. Some games require stones of different shapes. Often the game-boards are designed on the ground with chalk or a brick. In my childhood, we used dark coloured smooth tamarind seeds as the dice, by cleaving the seeds into two, so that one side is white and the other is dark. Thus, if you throw six pieces of tamarind half-seeds, you can count the seeds which land on their backs with the white part up. So come with me on this journey of discovering the traditional Indian games. If you have an opportunity to visit Bhopal, do not forget to visit the amazing Jan Jaati museum with its rich exposition of colours and arts of tribal India. If you can't visit it, you can get a glimpse of its wonders at the museum website. gate with their hands and sing a small ditty while the other children pass underneath. The ditty is: “Poshampa bhai poshampa, dakuon ne kya kiya, sau rupaye ki ghadi churayi, ab to jail mein jana padega” (Poshampa brother poshampa, what did the bandits do, robbed a 100 Rs watch, now they must go to jail). As the ditty finishes, the kid under the arms-gate is caught and has to choose between two words like allu-baigan (potato-egg plant) or sona-chandi (gold-silver) and depending upon the choice, s/he has to go behind one of the gate-kids and make a queue. Like this, all the kids are divided into 2 teams who will have a final round of pulling each other till one side falls. 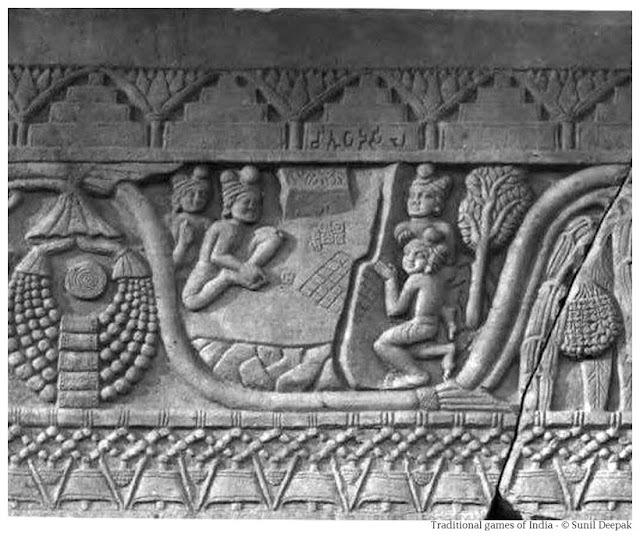 The image above from the tribal museum shows the final moment of the tug of war. Badam Shahi". However, we used to call it "Kokla-chhipaki". In this game a child playing Ghoda (horse) holds a cloth and sings a ditty while s/he goes around other children sitting in a ring. The ditty says, “Kokla chhipaki jumme raat aayi re, jeda aage pichhe dekhe uski shamat aayi re” (Friday night of the hidden Kokla has come, whosoever will look behind, will be punished). If any child tries to look back, Ghoda can hit that child with the cloth. While walking around, Ghoda quietly puts the cloth behind one of the sitting children. If Ghoda can complete one round without the sitting child being aware of the cloth at his back, Ghoda can beat that child with the cloth. Next, the child who was beaten becomes the Ghoda and the whole thing is repeated. Thus the child playing Ghoda has to be vigilant and cunning, keeping a poker-face so that the sitting children do not realise that the cloth has been left behind one of them. Kids are divided into 2 teams. Five or seven flat stones are placed one above the other in the centre of the space. A kid from team one has to throw the ball so as to break the stone-tower. While kids of the second team need to collect the ball and throw it so that it hits one of the kids of first team, the other team needs to rebuild the broken tower without being hit. If the first team manages to complete the tower without getting hit by the ball then they have 1 pitthu in their account. If they are unable to complete the tower and get hit, then it is second team’s turn to throw the ball. The team with larger number of completed towers (pitthu) wins the game. This was one of my favourite games in the school. I remember playing it with my classmates of primary school, early in the morning before the classes started. tree-climbing. One kid plays the stick-guard. Other children throw the stick as far as possible and while the guard goes to pick the stick, they all must climb on the tree. The guard brings back the stick, draws a circle around the tree and puts the stick in the circle. The children from the tree have to get down, pick up the stick and climb back without getting caught by the guard. The tribal museum of Bhopal has two beautiful installations on this game, shown in the images on the right and below. As the name suggests, it requires racing or dancing on the stilts. It is popular among Balga, Saharia and some other tribal groups. I was also unfamiliar with this game. This game requires a short piece of spindle shaped wood called Gilli or Gulli and a wooden stick called Danda. One kid hits the corner of Gilli with the stick and as it jumps up, hits it as far as possible. The other children have to catch the Gilli before it touches the ground. If they manage to catch it, it is their turn to play the game. If they can't catch it, the first player continues to hit the Gilli and go around. This was also very popular when I was a child. However, I was not very good at it so I did not play it often. This game is played by the tribal children in the coastal areas where they have to catch (Pakadia) a Machhali (fish) or a Kekada (crab) in the bamboo basket. I remember seeing children playing it in a river in West Bengal during my childhood, and I remember having tried in vain to catch a small fish with the basket. Thus this game is also unknown to the city kids. This is the ancient Indian game described in Mahabharat. It is played with 12 or 16 pawns and seems to be similar to a checker game popular in Europe (for example, in Italy they call it Dama). It is a strategy game like chess. However I had never played it as a child. We did play a simpler version of a game with such a board and dice that is similar to Ludo. It is said that the British took Ludo to Europe from India in the 17th or 18th century. This simple game needs at least three children. One child sits cross-legged and holds his/her feet, while the other two hold the sitting child by his/her elbows and then swing him/her till s/he looses the grip on his/her feet and or opens her legs and touches the ground. This game is played with 5-7 small round stones called ghite (singular Ghita). The player keeps one stone in his/her hand, throws it up in the air and in the mean time, picks up the stones in the centre, catching back the stone-in-the-air. If the stone-in-the-air falls down, the player loses the game. It becomes slowly complex – you start by picking one ghita at a time and then increase the number of stones to be picked or you need to do some specific movements while picking the stones. This game is played mainly by girls. An easier version of this game uses a ball, which is thrown up in air, while the player collects the stones. Village children often play with small wooden or bamboo carts (Gadi), pulling them around the village roads. Sometimes, the moving wheels action a stick which drums on the wood and makes a sound. Usually these require larger spaces that are harder to find in the cities. In addition, in cities we do not use carts. Thus, while I had seen these in the villages, I had never played with them. 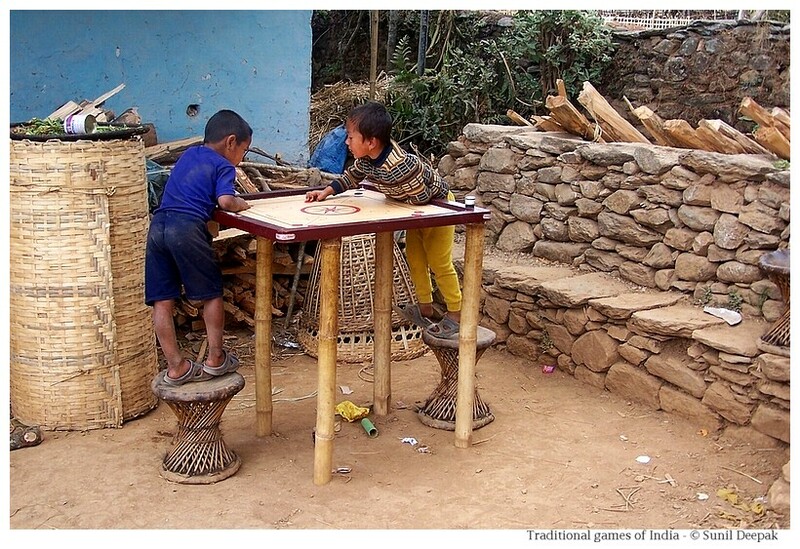 This game requires a special wooden board and special wooden round pieces called Goti. The Gotis are of two colours, white and black. In addition, there is a red Goti called the queen. The game is played by two or four players, divided into two teams, one black team and one white team. You need to hit the Gotis of your colour on the board till they fall in the holes on the corner of the board. The team that manages to get the red Goti wins the game. I loved this game and remember playing it even while I grew up and was studying medicine. Many years later, I had bought a carrom board and taken it to Italy to play it with my son. This game is usually played by young girls, where they play act to be ladies of the house, who cook and do household chores and make tea for the guests. They usually create a small separate space for playing it. 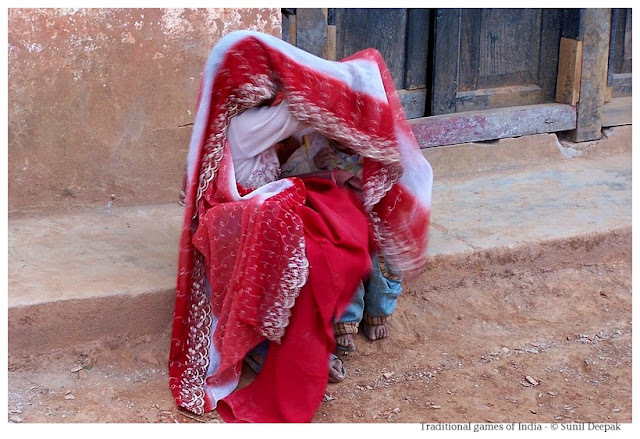 In the image below, the two children sitting on the roadside, were playing it wrapped under a sari. I remember playing it with my sister when I was around 5 years old and she was 3. We used to create our space between the charpaies, the light beds with wooden legs and woven with cord. These beds are laid out at night for sleeping and put up against the walls during the day to save space. I think that this game is a way for children to understand family relationships and gender roles, as during the play we used to mimic the exchanges between the adults of our families. This game is also played by two teams. A person, the attacker, from one team has to go to the other side while repeating kabbaddi, kabbaddi, to touch a player of opposition and then run back to his own side while continuing to repeat kabbaddi-kabbaddi without a break. The other team has to avoid getting touched and if someone gets touched then they try to catch the attacker and not let him go back to his side. Every touch accompanied by safe return to your side earns your team one point. In the image below, the guy in green dress is the attacker who has entered the space of the yellow side and is trying to touch someone of their team. This game is played by older kids, both girls and boys, though more popular among boys. India has different state level and national level championships of this game. It is very popular in rural areas. The Jan Jaati tribal museum of Bhopal is a beautiful place and merits a visit. I was really impressed by their beautiful art installations and the quality of tribal handicrafts. Their section on the tribal games is small but is very interesting, as you can guess from the images above. Visiting the games room of the Tribal Museum brought back so many memories of childhood games and I was surprised that after more than fifty years I still remembered the words of some of the ditties used with those games. Are you aware of games played by tribal groups in other parts of the world? Are there any games that are similar to the one described above? I feel that the origins of some of these games probably go back to our prehistoric ancestors and thus it is possible that ancient humans, as they spread out from their homelands, they took some of these games with them to different corners of the world. Let me conclude this photo-essay with two pictures - first image is of a kite carrying the colours of the Indian flag. During the month of August, in the midst of the monsoon winds and especially around 15 August, the independence day of India, a lot of children and adults like to fly kites. The second image is that of Biscopewalla (Biscope man), which can't be called a real game but was a way of entertainment during my childhood to watch some moving images and imagine ourselves in a cinema hall before there was any TV or video-games.